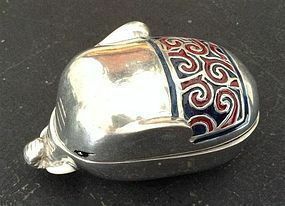 A lovely pewter and enamel box in the shape of a charming ELEPHANT that opens. 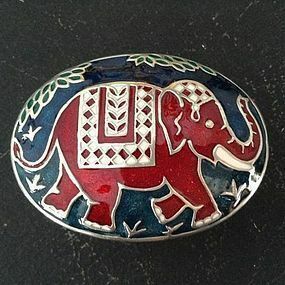 The saddle and the inside of the elephant have color enamel finish. Theses boxes are well made and of good weight, so also suitable as paper weight, pill box, for trinkets etc., ideal as gifts! Size: 5.5 cm. x 3 cm. x 3.5 cm. 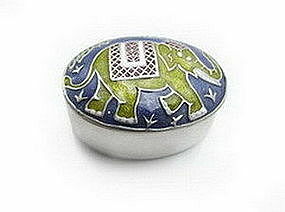 Beautiful enameled pewter Elephant Boxes which open. 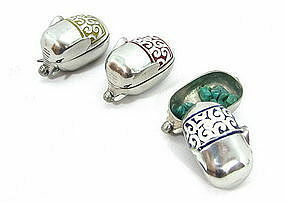 Ideal for pills or jewelry, trinkets etc. Available in 2 versions-colors: Red on Navy Blue OR Yellow on Turquoise. A charming, tasteful and very useful gift! Size: 5 cm. x 4 cm. x 2 cm. Please specify your choice of color when ordering. 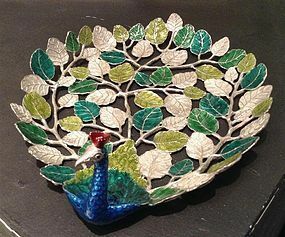 A very attractive enamel on pewter Peacock tray with a wonderful range of vibrant colors. This tray of finest workmanship is an ideal gift. Size: 22 cm. x 19 cm. 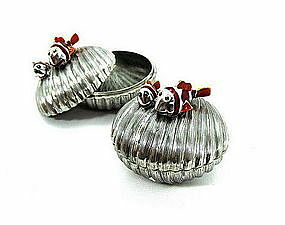 Stunning Enamel/Pewter Goldfish Tray ideal as Gift ! 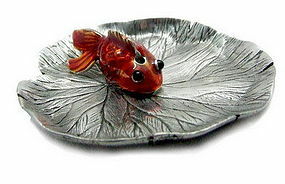 An adorable pewter Goldfish tray with vibrant orange-red enamel finish. This is a very attractive and unusual gift and yet affordable! 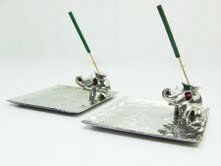 This special goldfish tray of high quality workmanship measures 15 cm. x 13 cm. and is sure to please those who already have everything! 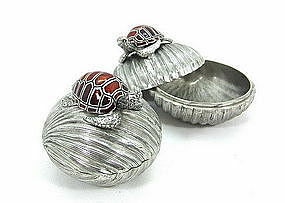 Very attractive woven Pewter basket with red Enamel finish inside and an elephant perched on top. Size: 7 x 2 cm. 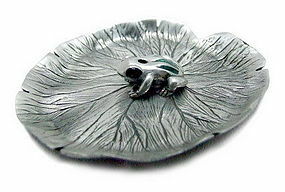 Pewter Incense Holder in the shape of a Lotus Leaf with an enamel Frog on top. Size: 6 cm. x 5.5 cm. x 1.5 cm. 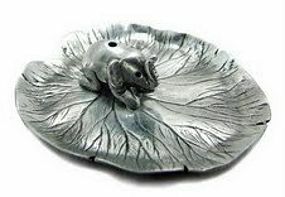 Very cute Pewter Incense Holder in the shape of a Lotus Leaf with an Orange Enamel Goldfish. Size: 6 cm. x 5.5 cm. x 1.5 cm. 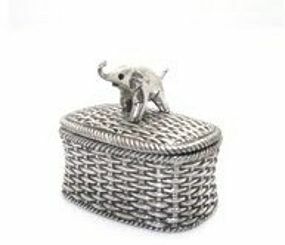 Very cute pewter woven basket with elephant on top. Inside of box has red enamel finish. Size: 3.5 x 5 x 4.5 cm. 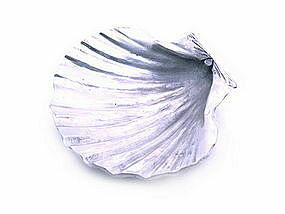 Elegant Pewter Shell Dish/Tray ideal for hors d'oeuvres or as a pretty Soap Dish for the bathroom. Size: 12 x 14 x 3 cm. 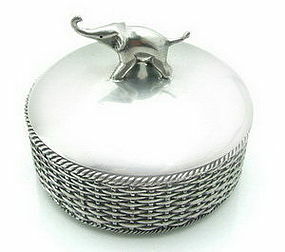 Very attractive pewter elephant box with fine 2 color enameling on top. Size: 4.1 x 5.7 x 2.7 cm. Superb gift and good value! 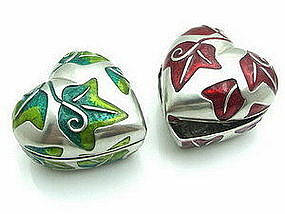 Very attractive heart pewter boxes with leaf decor and enamel coloring. Fine workmanship and good value! Please specify color. Artistic Hand with enamel flower for business cards! 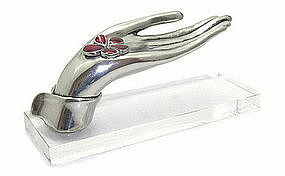 Very attractive and versatile pewter hand with enameled flower on stand. 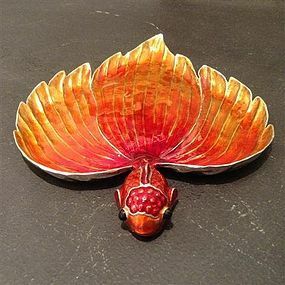 This hand is suitable for keeping your personal or company calling cards for clients to take, ideal as a base to display jewelry such as necklaces in a window or in the bathroom as a soap holder when entertaining guests! Excellent value and a lot of impact as very unusual.